Archeological evidence indicates that humans lived in Namibia at least 25,000 years ago. Our first inhabitants, the ancestors of today’s Bushmen / San People, left rock paintings and carvings in Damaraland and elsewhere in the country. The Bushmen, Damara and Namaqua people and immigrant Owambo Bantus were here when the first Europeans, the Portuguese navigators Diego Cão and Bartolomeo Dias, arrived late in the 15th Century. Eventually Namibia was colonized by Germany and then England before finally becoming a protectorate of South Africa. After a long struggle for independence, our country was emancipated on 21 March 1990. Today Namibia is a peaceful and economically stable parliamentary democracy with several political parties and a well-kept infrastructure. Windhoek, our capital city, has 350,000 citizens and is clean, cheerful and bright, with excellent shops and restaurants and wide boulevards. Our total population is but 2.1 million souls, in a land that spans about a thousand miles north to south and 500 miles east-west. Much of Namibia remains as it was centuries ago—a magical mix of stark beauty, natural wonders and amazing wildlife. From the Atlantic coast in the west to Botswana in the east and from the Kalahari region in the south to the Caprivi Strip in the north, Namibia offers spectacular landscapes of enormous deserts, rocky plateaus, green savannahs and lush tropical forests cut by mile-wide rivers. Our 240 species of mammals and 800 species of birds make up the greatest concentration of wild game remaining in Africa—lions, zebras, spectacular kudu and eland, heavy-tusked elephants, white and black rhinos, Cape buffalo, leopard, oryx, springbuck, hyenas and much, much more, including the world’s largest population of cheetah. 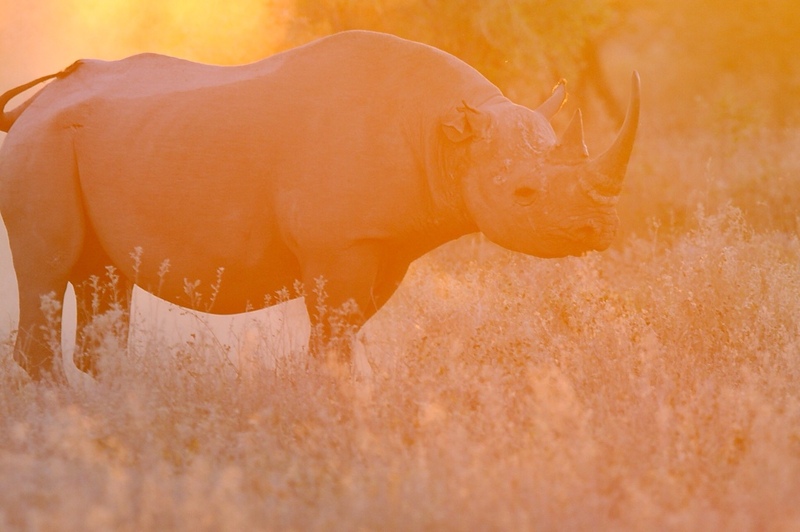 All of the Big 5 may be hunted in Namibia, on vast government concessions and private ranches and conservancies. Oh, and the sun shines 300 days a year.